Last updated on 09.07.2008 at 1430 Hrs. Refund of Rs 1430/- (Overpayment of Bonus) to our DTM (M) comrades. Matter taken up with Admin, refund likely to be made in a weeks time. Case regarding Payment of Arrears of Bonus and Medical reimbursement consequent upon upgradation of executives also taken up. The proposed Circle Secretaries meet at Hyderabad on 30th Nov 2007 is postponed. The new date will be announced in a couple of days. In view of the positive gesture shown by BSNL Management , United Forum has decided to call of the programme of mass Casual leave/Earned leave on 23rd Nov 2007. I. A Committee comprising of member from Management and one representative of each of the four constituent groups of the United Forum shall be formed to look into the genuine career aspirations of Executives and other related issues mentioned in the Charter of demands and the business needs of the Company. The Committee will be required to submit its recommendations within three weeks time. Until then, notification for recruitment of Management Trainees as per already notified RRs shall remain deferred. II. The United Forum appreciated the gesture shown by the Management and reciprocating the same, agreed to call off their agitation in the larger interests of the Company. Observe mass CL/EL on 23rd Nov.,07. Make it a complete success at all the levels. CHQ office bearers/CSs/SSASs/BSs and activists of the organization at all the levels must make all the arrangements and preparation to monitor and effectively implement the implementation of the protest action programme of availing CL/EL on 23 rd Nov.,07. MAKE DAY LONG DHARNA AT BHARAT SANCHAR BHAWAN ON 14-11-2007 A COMPLETE SUCCESS BY JOINING ENMASS. JTO to SDE Officiating Orders are in the process and likely to be issued soon. We are persuing it very hard. 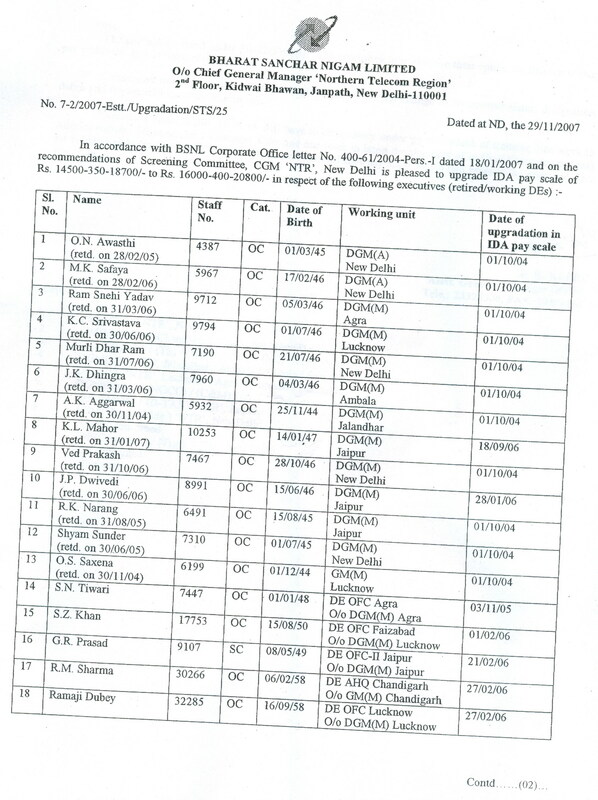 DEAR COMRADES CONGRATULATIONS, UPGRADATION ORDERS FOR LUCKNOW, CHANDIGARH AND JAIPUR HAVE BEEN ISSUED. 22/10/2007: CS replies CGM NTR ND letter received regarding the settlement of various issues of NTR while giving notice for organizational activities. PREPARE YOURSELF FOR TRADE UNION ACTION STARTING FROM 23/10/2007. HOLD MASSIVE DEMONSTRATIONS AT CGM, GM, DGM AND DET HQS ON 25/10/2007. TAKE MOST AGGRESSIVE POSTURES AND MAKE THIS DO OR DIE BATTLE AGAINST NTR ADMINISTRATION A GREAT SUCCESS. 19/10/2007: EFFORTS OF SNEA(I) BEAR FRUIT AS BHARAT SANCHAR NIGAM DIVAS WAS CELEBERATED IN NTP ON 17/10/2007. 28 OFFICERS/OFFICALS RECEIVED ATTI VISHISHT SEWA PADAKS AND SAHCHAR SHREE AWARDS. NTP HAS CONDUCTED THE PROGRAMME AFTER A LAPSE OF 11 YEARS---- THANKS TO OUR VIGOUROUS PERSUATION. 11/10/2007: MASSIVE DHARNA HELD AT BSNL CORPORATE OFFICE BY JOINT FORUM. SNEA (I) MEMBERS ACTIVELY PARTICIPIATED. 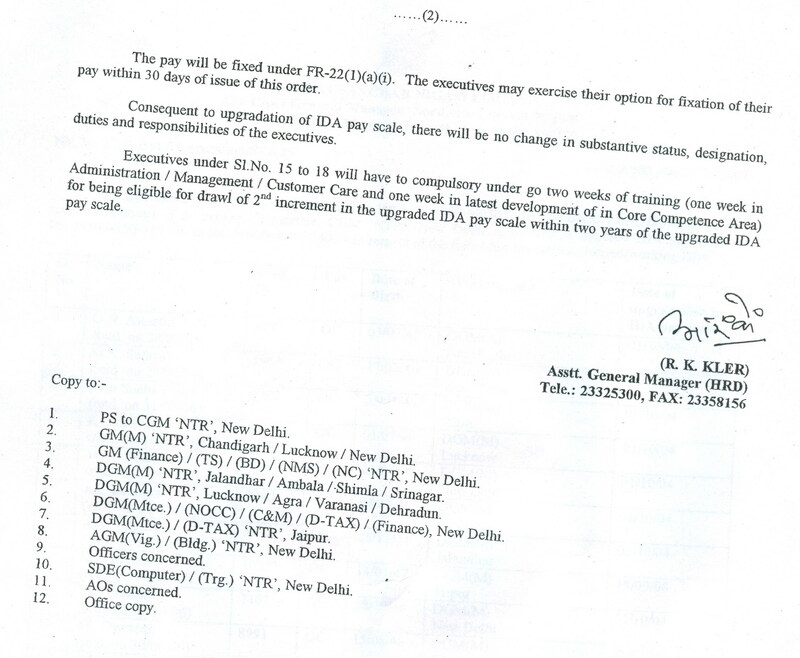 PLI Bonus payment is cleared in r/o all eligible staff of BSNLCO. Same has been credited to respective Salary A/C. The site is designed & maintained by Anupam Kaul Circle Secretary SNEA(I) Delhi Circle. N.B. : The information given on this site is restricted to SNEA (I) members only. The content of the pages of this site shall not be quoted or reproduced as an evidence elsewhere either in part or full for any purpose.